More information at unpleasantdreams.com or Wikipedia. With this beginning the macabre lady, who calls herself Vampira, invites her audience to watch a program of choice horror films, including such scary relics as White Zombie and Fog Island. Between movie reels Vampira provides eerie interludes of her own—a ghoulish hospital plan for would-be suicides called The Yellow Cross, a foaming cocktail “that will absolutely kill you.” Vampira was born Maila Syrjaniemi in Finland 31 years ago and her real hair is blond, but she has thrown herself wholeheartedly into her role, going abroad dead-panned and beshrouded even in daytime to enlarge her horror-loving public. DEATH’S-HEAD SOFA is used as a perch when Vampira addresses TV audience. She boasts her fingernails are hemorrhage red. SPIDER SEARCH with flickering candle is favorite Vampira interruption. Her fictitious pet spider, called Rollo, can never be found. ON TOUR of city Vampira sits regally in back of old Packard with chauffeur provided by TV station. She screams at stop lights. Is here waist like 3″ or what? Maila Nurmi her measurements were 36″ 21″ 35″. According to her Bio she had modeled for Vargas. “Plan 9 from Outer Space”. Too bad she never met Elvira… OR DID SHE??? I think they only met in court through their lawyers. I think Elvira was based on or replaced Vampira. Stephen: And according to the link I provided. I am sorry John, don’t know why I didn’t see your link when I wrote my comment. I am not sure where I saw it, perhaps the Plan 9 extras DVD I thought Elvira was the replacement for Vampira at that TV station. Mike: That’s fine. 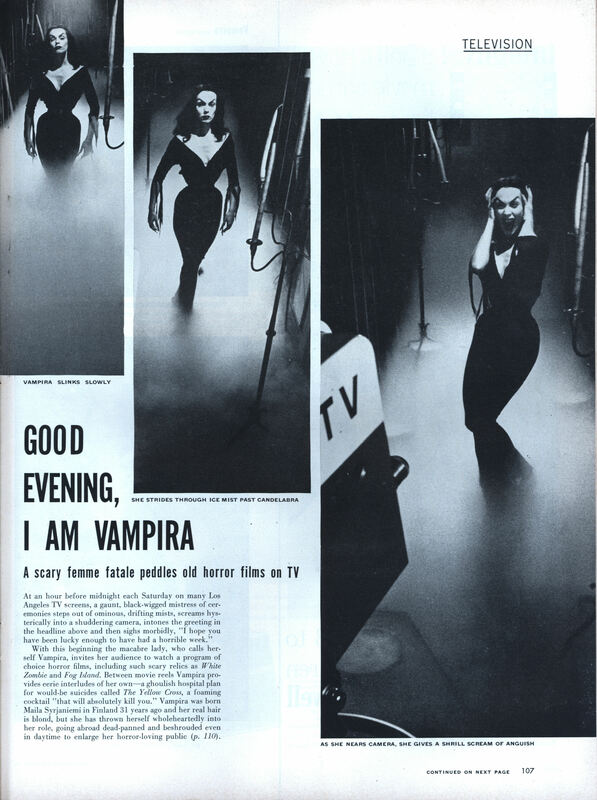 Vampira ended her show in 1955 and then was hired for a revival but she didn’t actually play Vampira, and then she quit and Cassandra Peterson was hired and became a different character. Part of the confusion is that we only have dueling interviews by Peterson and Nurmi as to who did what to whom and when.